Up until the 1980s, ATMs could only be found at banks. ATMs needed to be connected to its own phone line and the operating system had to be customized to each ATM location; otherwise, there was no way to verify the identity of the accountholder or whether the individual had enough money to withdraw cash. These restrictions not only limited the locations where ATMs could be placed, but also made ATMs expensive to install and maintain. 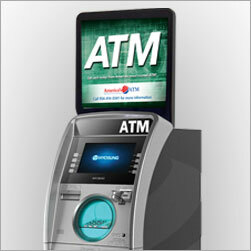 The development of digital telephony (which allowed data to be sent through public phone networks) and computer technology revolutionized ATMs. In the 1990s, two companies introduced ATMs that used dial-up connections, which allowed the machines to receive and send encrypted data through phone lines. This innovation completely changed ATM operations and led to a dramatic increase in the number of ATMs. Dial-up connections made it possible for the ATM to instantly verify the accountholder and the money they held in their accounts. Before these developments, banks usually restricted ATM use to individuals with a history of good banking habits since the machine could not verify the amount of money in a person’s account. Once ATMs could access the current balance of an account, banks were more willing to lift these restrictions. Furthermore, ATMs no longer needed to be located at a bank branch since the ATM could access a person’s account from anywhere. New companies sprang up that installed ATMs at a variety of locations, from malls and convenience stores to colleges and restaurants. These companies, known as independent ATM deployers (IADs), installed machines that were not affiliated with a particular bank. Today, over 50% of all ATMs are stand-alone machines owned by IADs. IADs greatly expanded the popularity of the ATM and made it possible for individuals to withdraw cash from their account from almost anywhere.